Hezbollah Secretary General Sayyed Hasan Nasrallah sounded alarm on Thursday over US President Donald Trump’s decision to recognize Al-Quds as Israeli capital, calling for a mass rally in Beirut’s southern suburb (Dahiyeh) next week in solidarity with the holy city. 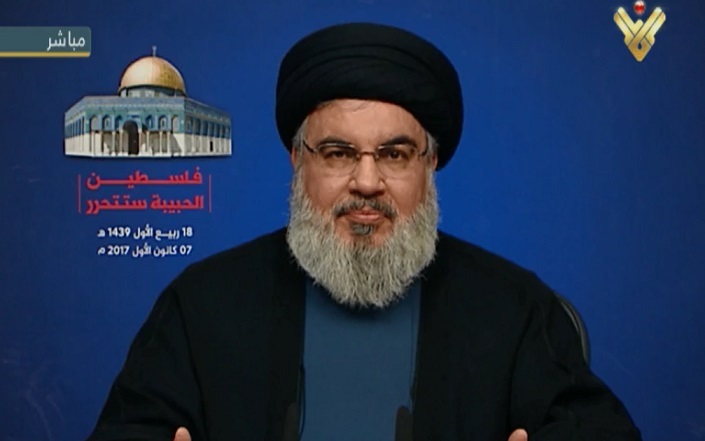 During a televised speech via Al-Manar, Sayyed Nasrallah said that Hezbollah supports Palestinian resistance movements’ calls for a new Intifada in response Trump’s move. His eminence said Israeli officials expect that all reactions to Trump’s decision by Arabs and Muslims are futile, but stressed that all Arabs and Muslims bear responsibility regarding the latest move by the US administration. Hezbollah S.G. called on Palestinian factions to announce that the so-called peace talks with the Zionist entity are over, stressing that ending all aspects of normalization between Arab states and the Zionist regime is the least reactions to what he described “blatant aggression” against Palestine, its people, holy sites and identity. Sayyed Nasrallah started his speech by talking about the dangers posed by Donald Trump decision to recognized Al-Quds as Israeli capital and his order to move the US embassy from Tel Aviv to the holy city. “After a hundred years, we feel that we are before another Balfour Declaration,” Sayyed Nasrallah said, noting that the Zionist regime doesn’t respects international resolutions. Sayyed Nasrallah pointed to the US stance towards the Israeli rush to implement its plot to Judaize Al-Quds. “The Zionist entity pays no attention to all international condemnations, it cares only about the US stance,” Sayyed Nasrallah said, noting that throughout years, the US stance tactically prevented such Israeli rush to judaize Al-Quds. However, he noted that this “US barrier” has gone now through Trump’s move to recognize Al-Quds as an Israeli capital. Sayyed Nasrallah here elaborated on the dangers of the US move, wondering about the fate of Al-Quds residents and their lands. “The holy sites in Al-Quds are at real risk, especially Al-Aqsa Mosque which may be demolished at any time,” Sayyed Nasrallah warned. Turning to talk about significance of Trump’s decision, Sayyed Nasrallah said most of the countries across the world voiced opposition to the US move. Sayyed Nasrallah said that the US president has violated international resolutions and accords. On the other hand, the Lebanese resistance leader wondered about the the value of the US-Arab alliance. “Arab states have to know that they mean nothing to Trump and to the US,” Sayyed Nasrallah said. On the other hand, Sayyed Nasrallah warned that the situation is critical and requires all sides in the Muslim and Arab Ummah (nation) to bear their responsibilities. His eminence cited Israeli officials who expected that whatever Muslim and Arab reactions were they would be futile, especially that all Arab countries have been busy with their own internal problems. In this context, Sayyed Nasrallah noted that the US stance took these givens into consideration and based on them Trump recognized Al-Quds as an Israeli capital. Meanwhile, Sayyed Nasrallah called on Arab leaders to hold an Arab summit and issue a resolution that binds all Arab League members to announce that Al-Quds is an everlasting capital of Palestine. “I think that such measures will prompt Trump to mollify his decision or at least freeze the validity of his order. Sayyed Nasrallah also called on Arab governments to halt wars and infightings and unite for Al-Quds. His eminence meanwhile, hailed the Lebanese stance towards Al-Quds issue announced by President Michel Aoun, Premier Saad Hariri and Speaker Nabih Berri. Talking more about Lebanon, Sayyed Nasrallah called for a mass rally next Monday in Dahiyeh in order to voice opposition to the US decision.